Manny Pacquiao addressed his supporters after returning home to the Philippines on Monday. (CNN) -- Filipino boxing legend Manny Pacquiao has dropped a shock hint that he might quit the ring -- because his mother does not want him to fight anymore. Pacquiao is widely expected to fight Floyd Mayweather Jr. in a much-hyped showdown later this year, but the 31-year-old claims his place in boxing history is already assured following the successful defense of his WBO welterweight crown against Joshua Clottey last week. "I reached my dream as a boxer without Floyd Mayweather in my career. I do not need him, they are the ones who need me," he told reporters as he returned home to his customary hero's welcome in the Philippines on Monday. 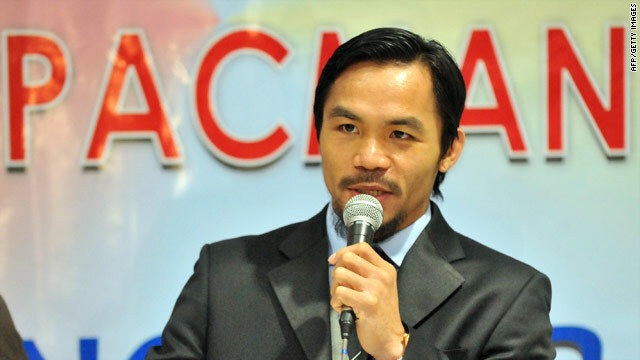 The fighter, known as "Pacman" by his fans, is now concentrating on his political career. He is standing for election in the Sarangani province on May 10, on the platform of opposition senator Manuel Villar's Nacionalista Party. Pacquiao's personal Web site has carried media reports detailing how his mother Dionesia has implored him not to fight anymore, prompted by the ear injury he picked up in his battle against Miguel Cotto last year. "She kneels down and cries every time [she asks me to quit]. That's a heavy burden when it's my mother doing that," he told reporters after meeting Filipino President Gloria Macapagal-Arroyo in Malacanang on Monday morning. "I have been boxing since I was 12 years old. Now I'm 31, so I'm seriously thinking about it. I will discuss it with my family. "I have been in boxing for a long time and I have given so many honors to my country. Even without the elections and the politics, my retirement will largely depend on my family's decision." Villa, a millionaire property developer, met Pacquiao at the airport and the boxer was quick to sing his praises. "What we need now is a man who rose from poverty, who understands the call of the poor like myself," Pacquiao said. Pacquiao has now won 12 straight fights and titles at seven different weights to establish himself, according to the rankings by respected boxing magazine Ring, as the best pound-for-pound boxer in the world. A money-spinning fight against the undefeated Mayweather fell through earlier this year when the American insisted on Olympic-style drug testing, leading to a war of words and a stalemate in negotiations. Pacquiao opted to fight Ghana's Clottey, whom he beat in 12 rounds, while Mayweather will take on fellow American Shane Mosley on May 1. Any likely meeting between the two would probably be the richest in box office history and be staged at the MGM Grand in Las Vegas, although Pacquiao filled the home stadium of the Dallas Cowboys NFL team -- where the Mayweather fight was initially scheduled to be held -- for his bout with Clottey.